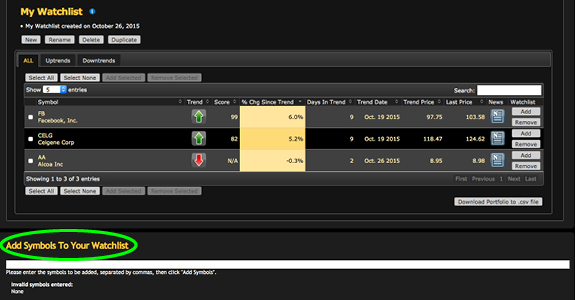 Click on a question to see the answer to our frequently asked SmarTrend trend trading systems questions. How to create a Watchlist? Select “New” from either your dashboard or the My SmarTrends Watchlist area. The following dialogue will appear, prompting you to enter a name and description. 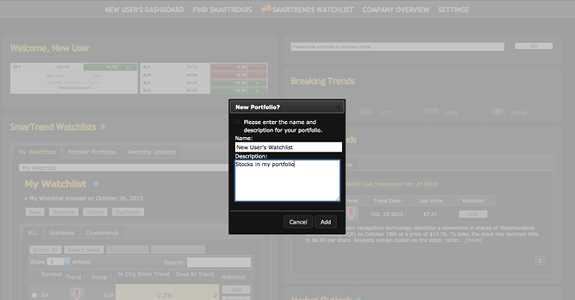 After selecting “Add,” the following screen will confirm your new watchlist. Stocks may be entered to your watchlist in several ways: Individually, by entering the company name into the dashboard. For Apple, you will see the following page, after you may click “add” to add the symbol to your watchlist. You may add a list of symbols from filtered results in the Find SmarTrends section by selecting the check boxes next to each symbol and selecting “Add Selected”. To add a list of symbols, visit “My SmarTrends Watchlist” and scroll down to the “Add Symbols to Your Watchlist” section. For more ideas on stocks to add to your watchlists, you may browse: Premier Portfolios: our analysts’ selections organized by theme, located on your dashboard and in the My SmarTrends Watchlist section. Top Trending Stocks: our top scoring trends over the past two weeks that are moving inline with their forecasted trend, located at the bottom left corner of your dashboard. Featured Trends: our analysts’ write-ups on stocks of interest. 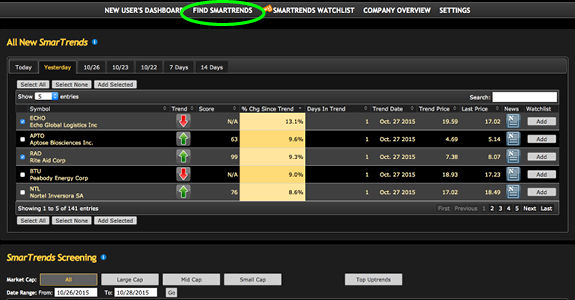 Find SmarTrends: View trends organized by date or filter by market cap, sector, industry group, and other fundamental factors. Can SmarTrend products be used for day trading? SmarTrend Advanced provide real-time changes in trend direction for over 5,000 stocks, which may be utilized to identify short-term trading opportunities. For specific buy and sell recommendations, SmarTrend Advisor provides a model portfolio that holds up to 25 positions for an average holding period of 5-25 days. Does SmarTrend recommend shortable stocks? 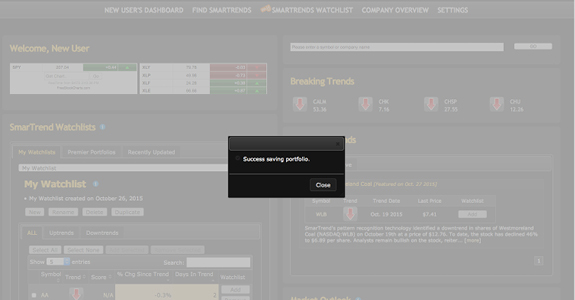 Yes, SmarTrend downtrend alerts are shorting opportunities, while uptrends are long opportunities. SmarTrend covers a universe of over 5,000 U.S. equities, providing ample short and long opportunities. 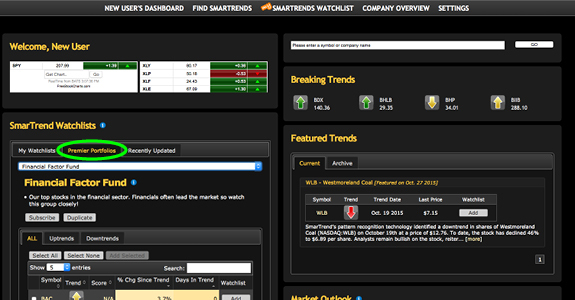 To see which stocks are currently changing trend direction, please sign up for a free trial. Does SmarTrend products cover foreign markets? SmarTrend only covers US equities. What is the meaning of Trend Score? Is a higher score indicative of stronger trend? The buy score is in indicator of the probability of the stock continuing to move in its trend direction. Stocks with a buy score above 80 are most likely to continue in their trend direction. Buy scores are only calculated for stocks in an uptrend. How do I enable email alerts? To receive e-mail alerts, stocks of interest must first be added to a watchlist. To get the email alerts from the stocks that are in your Watchlist, you want to make sure that your email alerts are enabled. You can view that by clicking on the Preferences tab, and look to see if your email alerts are enabled or disabled. If it says disabled, please go to the Preferences tab, and click on the check box next to email alerts, and then hit the submit changes button to the right. The trend price refers to the price at which SmarTrend identified the trend change. This price will not change and could be higher than the closing price of a stock in your Watchlist depending upon the movement of that particular stock for that day. Can I get email alerts for all trends that are issued? The up and down alerts you see on the website under the All SmarTrend Alerts tab, will not be alerted to your email. The only email alerts you will receive will be for up or down trends issued on stocks that you've included in your Watchlist. Can I see all the trends that have been issued? SmarTrend allows you to filter up to two years of trends. Please visit “Find SmarTrends” and scroll down to the bottom “SmarTrends Screening” section and adjust the date range to two years. This page may take a little while to load due to the volume of information. How do I add symbols to My Watchlist? 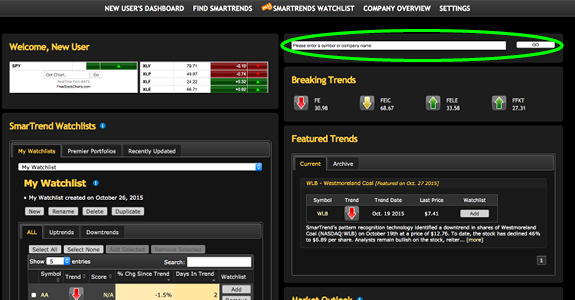 From the SmarTrend Alerts tab, click "Add" in the Watchlist column of the list of daily alerts. From the My Watchlist tab, click "Add symbol to watchlist,” and enter a list of symbols you wish to watch into the Watchlist Entry field. From the Charts tab, search for symbols you wish to view charts for, and click on the "Add to Watchlist" button to add the symbol to your watchlist. From the Symbol Lookup tab, search for company names, and click "Add Watch" next to the appropriate symbol returned from your search. Why are some stocks listed as unavailable? SmarTrend tracks most equity securities traded on US exchanges and OTC/NASDAQ, its sophisticated pattern recognition software can only issue alerts on companies with enough market data (at least 1 year of trading data) to provide statistically accurate information. Are Uptrend recommendations a signal to buy a stock? When an uptrend is issued by SmarTrend’s pattern recognition system, it is a signal that the price of the stock is increasing. The decision to purchase a stock is ultimately up to the SmarTrend subscriber and should be based on individual discretion. Is information available on ETFs, ProShares and Direxion Shares symbols? SmarTrend does cover an array of ETFs including EMF, ROM, XLB, XLE, XLF, XLK etc., ProShares including QLD, and DirexionShares like EDC and EDZ. How can SmarTrend be used for options trading? Since SmarTrend provides subscribers with short-term trend predictions that range anywhere from 15-45 days, experienced option traders can use our UPTRENDS to purchase call options that are either front month or one month out. Call spreads would be another viable strategy that would be slightly less risky. The choice of strike price would ultimately depend on the risk tolerance of each investor but could range from deep in the money calls, to slightly out of the money. But given the near term nature of our trend calls, going too far out of the money may not be as desirable. Similarly, our DOWNTREND calls can be used to purchase put options or put spreads using similar time periods and strikes. Further, if an investor is long a certain stock, a DOWNTREND signal could be used to purchase put protection (or perhaps sell an out of the money call) should prices fall and should the investor not want to sell his or her shares for other reasons. How long does a trend last? What do the trend terms in the Morning Call mean? Our trends typically last from 1-2 months but can very easily be longer or shorter depending on market conditions and volatility. Historically/statistically they rotate every 1-2 months. After a trend is issued, when is the right time to invest or sell? Trend arrows generally indicate when trades should be initiated (up or down). The opposite arrow is not intended to be the closing position signal but rather a new signal of a trend beginning in the opposite direction. Some of the most successful users of our system, including professional asset managers, use the system to time initial position entries and ideally, they are out of the position before the corresponding opposite trend alert occurs. Over a period of time, trading these trends will produce positive results so it is important to not focus on the most recent trend call in any trend trading system - especially given the recent choppy markets we have endured this year. Most of the stocks in the SmarTrend Global Portfolio have shown to be better traded using our system rather than buy and hold or guesswork. There are always exceptions which is why a balanced portfolio is always recommended. 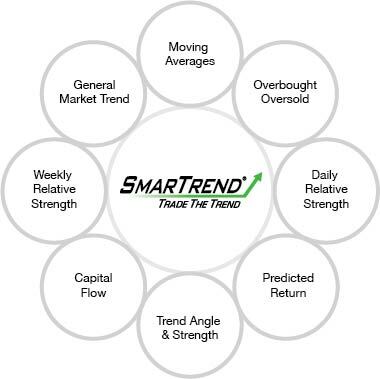 80% of your gains tend to come from 20% of your picks and fortunately SmarTrend has thousands of trends from which to choose in a variety of sectors. What are some optimal stocks to use with SmarTrend? Are more volatile sectors better? With trend trading, less volatility is often better. More volatile stocks will have a greater frequency of trend calls meaning the trend changes will be closer together as compared to a PG or MSFT which only changes its trend every few months or so. But with those stocks, when the trend does turn it usually stays that way for quite a while and they tend to more accurate. With the more volatile stocks, since we have a greater number of trend calls they are more susceptible to reversal or quicker whipsaw. In our system we provide a trend history table and annotated chart where you can see just how often a stock changes its trend and the length of time between each. It is a good idea to have a mixture of positions. Some allocated (but smaller amounts) toward the more "stodgy" names that may not be as exciting but when they do change trend they will more reliably go in that direction for a longer period of time. So those stocks tend to make up the "core" positions in the portfolios of our subscribers. The quicker trend-changing stocks tend to have a bit smaller allocation and more trader friendly as you need to be more nimble and prepared for the next move. Why did the trend price change overnight after the trend was confirmed? 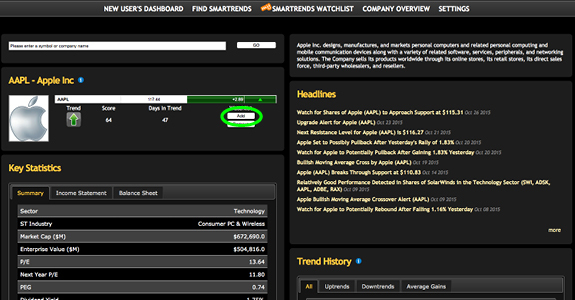 When a trend alert is issued in real-time, we use the last price so users can get the most up to date information. We issue information that occurred at this “tipping point” of the trend change process. As we do with all of our trends each day, we scrub the data overnight during our overnight confirmation process to see if such a trend is confirmed. A very small percentage go unconfirmed for certain technical reasons and if a user has the stock in their watchlist, they are notified by email. Our confirmed trends then get what is called the MHL price which is the midpoint of the high and low of the day. This price is more conservative and accurate statistically when conducting back test studies as it represents a fair price that a user could have bought the stock at some point that day. When a user looks at Trend History, we want to show prices that a typical user might have been able to achieve vs. using “last price” or something of this nature that is not always achievable according to our 25 years of studies on this issue. In certain cases, subscribers were notified earlier and received a better price than our performance on those trends will reflect. But at the end of the day, the exact price is not all that important given the nature and length of our average trends. The unconfirmed is real time and the history / confirmed is MHL which is the midpoint between the high and low. There is no bias – ALL trends are based off of MHL but on a real time basis, when a stock is unconfirmed intraday, we cannot compute the MHL yet so we use real price to give subscribers the tipping point price that cause the trend. But when we confirm ALL trends we use MHL which is a price that most traders could have received, on average, if they bought that day. 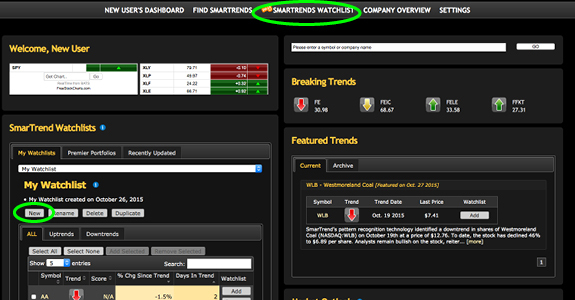 How do the Featured Trends perform in comparison with the rest of the trend calls made by SmarTrend? 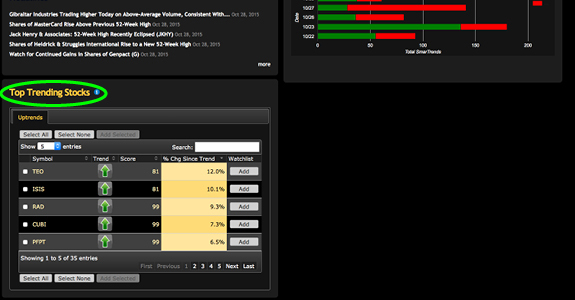 Featured trends are partly based on our scoring algorithm, which ranks all of our Uptrends. Based on our studies of the top 3,000 stocks by market cap, high scoring Uptrends outperform all other Uptrends by about 40%. We use Featured Trends to provide an example of how SmarTrend research can be used to generate trade ideas. How do you calculate Free Cash Flow(FCF)? FCF is cash flow from operating activities less capital expenditures (capex). In the case of REITs, capex is often called real Estate improvements. How you calculate the score for trends? Our trend scores are generated by a proprietary formula used to provide users with a rating system for uptrends, or long opportunities. The score ranges from 1-100 and is assigned the day the stock moves into an uptrend and does not change. Scores above 80 have a higher likelihood of continuing in their trend direction. A user can use the filtering system to sort by trend score by clicking on the small gray arrows in the Trend Score column heading. How does your system calculate trends? We measure cycles of rotations of stock prices from peak to trough to determine patterns that we expect to repeat in the future using a mix of 80% technical data and 20% fundamental data We have found that measuring amplitudes (such as sine curve) has very high predictive characteristics. Below is a diagram of a number of data points we monitor on over 5,000 stocks in 5-minute intervals throughout the day. The remaining 20% utilizes valuation and relative valuation methods (P/E and PEG). The reason for the heavy weighting of technical data is because our fundamental belief is that the price and direction of price (and volume) reflects all the fundamental information available to the market. Take the guesswork and emotions out of stock market analysis and trading. Become a SmarTrend subscriber now and take advantage of our FREE 14-day trial. You will receive your login credentials immediately— and then you have 14 days to use winning SmarTrend Alerts for FREE!